Argggh! We’re so conflicted on this one. For 12 months we’ve been tracking the progress of Birmingham indie-rock quartet Peace and at long last the band have released their debut album. 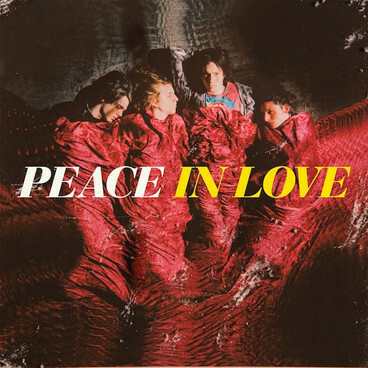 Peace unleashed their first single upon the world back in April 2012. Entitled “Follow Baby”, the single was released as a limited edition 7″ and immediately record labels entered a bidding war to sign the band. Peace decided on Columbia/Sony as the label of choice. Peace then had the label erect a billboard in their hometown of Birmingham reading, ‘WHAT THE FCK BIRMINGHAM’. Their debut release for Columbia was the ‘Delicious‘ EP, which was released in September 2012 and included the irresistible “Bloodshake“. Only months after the ‘Delicious’ EP, a new single entitled “Wraith” surfaced and already the band sounded infinitely more confident (read our review of “Wraith”). A re-recorded version of their brilliant first single “Follow Baby” was then re-released as the next single (read our review) from the upcoming album. Produced by Jim Abbiss (Arctic Monkeys, Florence and The Machine), ‘In Love’, the 10-song debut, is a trip down memory lane, specifically back to 1990-1993. Despite the name, opening track “Higher Than The Sun” is not cover of the Primal Scream classic but we’re pretty sure the reference is a deliberate one. The song starts off sounding like TOY with its psychedelic flourishes before elevating into a double-time chorus oozing pop goodness. The psychedelic instrumental bridge adds a little something to an otherwise tried-and-true pop number. Current single “Follow Baby” follows next channeling The Stone Roses and Happy Mondays with a dash of Kula Shaker and then paired with present day indie-rock. Backed by a baggy, EMF-style beat, the guitar work is particularly impressive with one of the coolest main riffs in an eon. The song’s summer-tinged chorus is complete with gorgeous harmonies and the words “we’re gonna live forever” sounding aloud in true anthemic tradition. “Lovesick” is sickly sweet, addictive indie-pop with a strong 80’s character and is a ready-made anthem. Turning things down a notch, “Float Forever” is a psychedelic-tinged, chill-out indie-rock number that features some tasty bass playing and all the making of another Peace anthem. First single, the uptempo “Wraith”, begins with Foals style guitar noodling before sliding into a danceable shuffle during the song’s hook-laden chorus with The Kooks springing to both musically and vocally. Hand percussion and shakers are added giving the songs are tropical accent. “Delicious” marries present day indie-rock styling with The Stone Roses and it’s at this point that it becomes apparent that while no one can doubt their songwriting chops and ability to write killer hooks, the album lacks an edge. Like the debut album from Theme Park released last month (read our review), while we can cite influences and sound comparisons (in the case of Theme Park, that would be Talking Heads), the experimentation in songwriting shown by the first wave of bands is largely absent in the revivalist’s music who instead opt for more safe and formulaic writing as if they’re writing for the ADD generation. It’s all just a bit safe. At least on Peace’s EP, ‘Delicious’, the final song “1988 (Delicious)” clocked in at 10:08 and showcased a experimental side to the band. Live, the band also put on a cracking show, which makes it all the more disappointing that ‘In Love’ just doesn’t blow you away the way it should. “Waste of Paint”, another finely crafted pop tune, employs similar songsmarts to “Follow Baby” but not much else. “Toxic” is a power-pop number that recalls Blur mixed with Teenage Fanclub with a hint of psychedelia. Album closer “California Daze” is the album’s “ballad” – a gorgeous, summer-soaked anthem complete with psychedelic coo-ing and a perfect end to the record. When reviewing “Follow Baby” last month we said we wouldn’t be surprised if the band’s debut is not only of the year’s finest but one of the biggest British rock albums this millennium. Individually the songs are great and present themselves as incredibly solid singles but track-after-track as an album the formulaic nature chokes all “wow” factor and thus prevents ‘In Love’ from being a truly great or innovative album. The upside is being that they’re such a young band it’s an exciting prospect to think of what Peace may be able to achieve in three or five years down the line. The album ‘In Love’ was released today, 25 March, 2013.